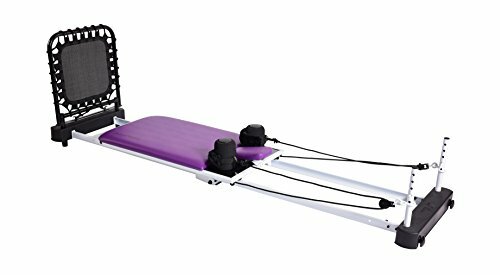 The Ultimate Pilates mini reformer, the Pilates Power Gym PLUS replaces over 17 weight machines for an incredible workout. This is a serious piece of equipment, built with a sturdy carbon steel frame that can hold up to 300 lbs. Great for the whole family, It features padded handles, comfortable foot straps and variable resistance cords that allow you to adjust the gym to your fitness level in seconds... Plus the quick-change height provides power for pro-caliber strength training. Whether you're an absolute beginner or a Pilates pro - the Pilates Power Gym PLUS is the right machine for you. The Pilates Power Gym PLUS marries fluid, smooth resistance to natural, organic movement - toning and tightening your calves, thighs, hips, abs, shoulders, arms and back with long, relaxing motions - motions so instinctive, you'll learn them in minutes. 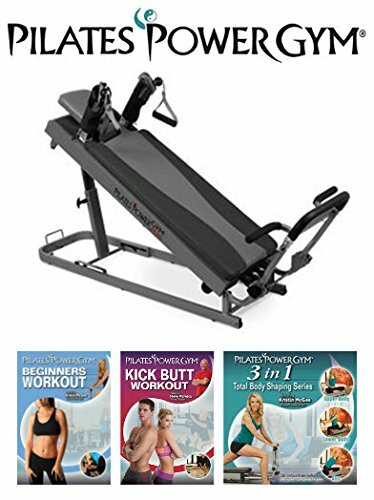 The Pilates Power Gym PLUS features an Upgraded Padded Glide Board, Adjustable Headrest, Foot Straps, Tension Cord and the" Eat Smart" nutritional plan for weight loss! And with the PLUS, you'll have 15 height elevation options along with 4 tension cords that give you 248 possible resistance levels. the Push Up Bar for upper body routines, and 3 of our favorite workout DVDs featuring celebrity yoga and Pilates instructor Kristin McGee and Steve Maresca. Each workout DVD offers with simple step-by- step routines that will teach you the most effective Pilates moves while having fun all the way through. Whether you're a beginner or advanced, The Pilates Power Gym PLUS is the is the perfect mini-reformer for you and your family. Perform your Complete Pilates Reformer Workout in Your Home, On Your Time! Full 1-Year Manufacturer's Warranty. Kristin McGee is a celebrity yoga and Pilates instructor based in New York City. She is one of the most respected yoga and Pilates instructors today. Steve Maresca brings his love of fitness and a dynamic energy-filled experience to all his training sessions. Combines the best of traditional Pilates workouts and Strength Training in one machine. ALSO INCLUDED: 3 Pilates Power Gym Work Out DVDs to get you started and help you reach your fitness goals. Brand: Pilates Power Gym | Manufacturer: KASWIT, Inc. The Aero Pilates Reformer 266 is the newest addition to the Aero Pilates line. 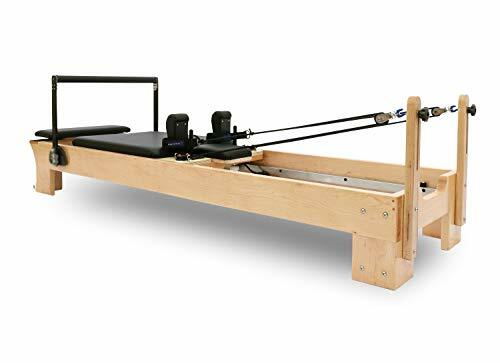 This reformer comes with three black standard resistance cords. The comfortable padded carriage glides smoothly and quietly on the steel frame. 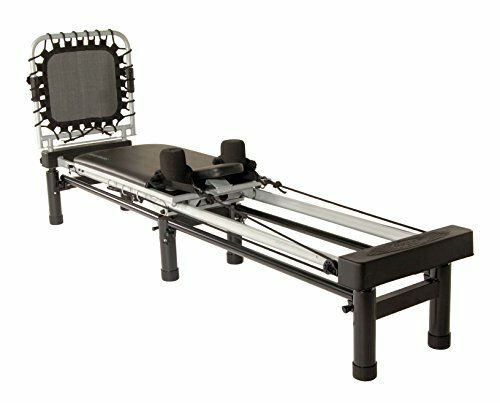 The Reformer 266 comes with the Aero Pilates stand to elevate the reformer about 10 Inch off the ground to allow for more advanced Pilates exercises. Get a lean, sculpted body with the Aero Pilates Reformer 266. 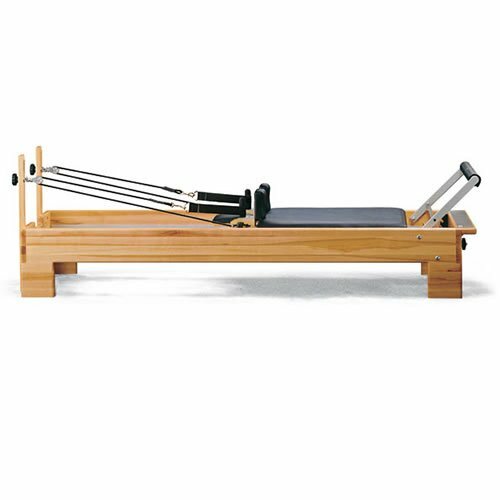 The AeroPilates Reformer Plus 5006 offers five resistance cords, the most we have ever offered. With 1 yellow (.5) 2 black (1) and 2 red (1.5) cords, you are able to set 16 levels of resistance to make your workout as intense or easy as you prefer. The introduction of the yellow cord (.5) means that the AeroPilates aficionado can now truly challenge their core. As you know, using more cords is harder on the major mobilizing muscles, but fewer cords make the exercise more intense on the core. The AeroPilates Reformer Plus 5006 reformer has many other extra features including a wider platform, for more upper body space, a larger Cardio Rebounder, a standing platform to challenge your balance , fur hand grips and is able to hold up to 350lbs. The pulley risers allow you to adjust the height of the straps, which alters the angle and intensity of each exercise. The Reformer Plus 5006 comes with 3 DVD's featuring 10 total workouts with AeroPilates expert Marjolein Brugman. For a larger user or simply one who wants the top of the line reformer, the AeroPilates Reformer Plus 5006 is able to provide more comfort and luxury in your AeroPilates routine. When you elevate your reformer, you're not just making it easier to mount and dismount; you're making it possible to perform more advanced Pilates exercises. The AeroPilates Stand is made specifically for AeroPilates three-cord reformers with the smaller frames, lifting them 10 inches off the ground. 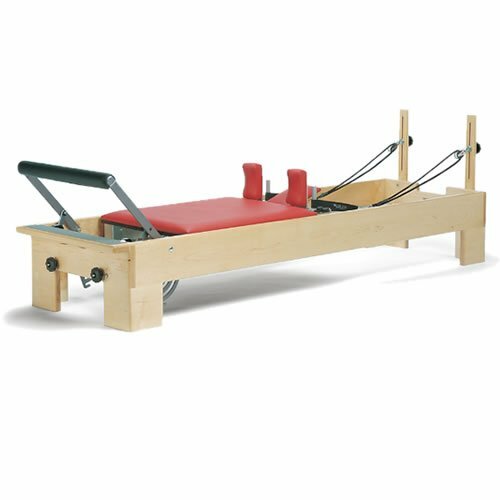 The rubber-tipped legs prevent skidding to keep your reformer stable even in the most intense of Pilates workouts. Even more, the stand is convenient. The six easy-to-remove pull pins allow you to assemble and disassemble your stand with ease. 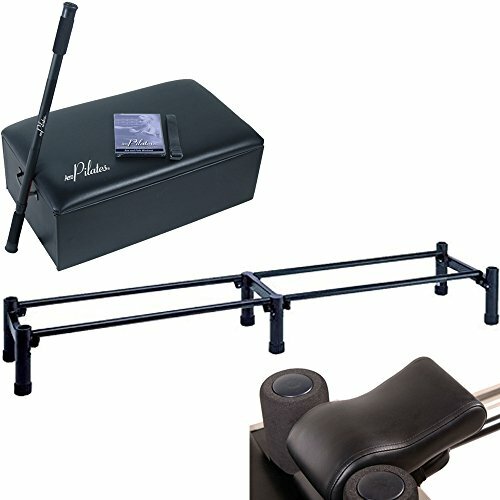 Perform more advanced Pilates movements with the Stamina 55-4050 elevated stand. 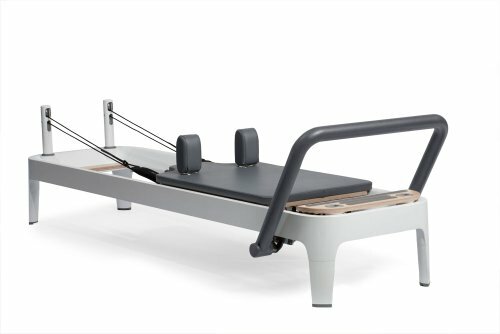 The unit--which is designed specifically to accommodate the Pilates Performer 4000, Pilates Performer 4500 JP, AeroPilates Performer 296, and AeroPilates Performer 295--elevates your reformer by about 10 inches to create a more stable and secure workout surface. The elevation also makes it easier to move from exercise to exercise--a must when designing an intense workout. Details include six easy-to-remove pull pins for quick assembly and disassembly, a heavy-duty steel frame, and a 90-day warranty. Light assembly is required. - Strata Rock Maple frame provides the longest standard carriage ride in the industry at 41 inches (104cm), with a precision carriage tracking system and 5 range-limiting carriage stops. - Classic Footbar has 2 supports and adjusts to 3 heights (including down). - The No-Roll Springbar safely keeps springs connected and is easy to use. - Twistlock shoulder rests for quick adjustments or removal, precise, non-slip rope system with nautical cam cleats. - Package of 5 long-lasting Balanced Body Signature Springs. - Comes with upholstered sitting box, cotton foot strap, Neoprene handles. Expand Your Workout Do you feel you've worked to the max potential on your AeroPilates Reformer? Take the next step and shoot for a new level of performance with the AeroPilates Advanced Kit. The Advanced Kit comes with three accessories designed to help you achieve the fitness goals you desire most. Box and Pole Widen the possibilities in your AeroPilates routine with the Box and Pole. Adding a level of elevation to your workouts engages a more complex combination of muscle groups, allowing for wider flexibility and range of motion. You'll feel safe and secure with the durable, padded design. Placing and removing the box on your Reformer is simple with handles on both ends. The adjustable-length pole assists you in standing exercises of all kinds, providing an extra level of balance. Lastly, the Box and Pole includes a workout video that gives you instructions on how to use them to enhance your workout. Pull Up Bar Pull-ups and other similar upper body exercises are great for burning fat, toning muscle and boosting cardiovascular endurance. However, it is an extremely difficult exercise to execute. The AeroPilates Pull Up Bar is a great alternative for people of all fitness levels. It's a simple way to create the same tone and definition in a lying-down position. The raised nature of the bar also allows for a wide variety of other new exercises. Throughout your exercise, the padded grips will help minimize hand discomfort. The resistance is easily adjustable by using one, two, three or four cords. For quick reference, the bar comes with a wall chart of exercises. Switching the risers out with the Pull Up Bar on your Reformer is also as simple as loosening the knobs and replacing. - The Revo System delivers the easiest and quickest adjustments available. Locking Revo Footbar offers 4 positions, comfortable padding and non-slip surface. Revo Springbar moves the carriage to/away from the footbar while maintaining neutral spring tension. Five positions allow 12 inches (31cm) of adjustability. - Twistlock shoulder rests provide quick adjustments or removal. - Precise, non-slip rope system with nautical cam cleats. Strata Rock Maple frame provides the longest standard carriage ride in the industry at 41 inches (104cm). Precision carriage tracking system delivers the smoothest, most quiet ride available. Revo System is an integrated carriage and springbar; moving the springbar moves the carriage and keeps the springs in neutral tension. Revo Footbar locks securely for safety. Comes with upholstered sitting box, cotton foot strap, Neoprene handles and includes streaming video workout. Pilates Wood Reformer with great strides and outstanding finishes. A dynamic and very comfortable machine. Ideal for studios seeking the cozy and pleasant atmosphere the Rock Maple Wood provides. A favorite among health and fitness professionals. Incredibly adaptable and durable, exceptional versatility to accommodate a range of body heights, sizes and abilities. Superior construction for maximum safety and durability. It offers perfect stability and is very resistant. A whisper-smooth patented rolling mechanism to ensure precise and safe operation. It incorporates innovative systems such as the rapid change of foot bar positions, spring bar and pulleys. It has wheels for easier transportation. The reformer includes: oOne pair of quick-release and removable shoulder rests. oOne pair of pulleys. Adjustable in different heights with detachable wooden elevator. oSilent and soft bed sliding system, thanks to its system of 8 vertical and horizontal PU wheels. Silent precision bearings. oPadded headrest provides 3 positions: 2 above carriage and 1 leveled with carriage. oAdjustable and high resistance ropes with snap included. oSprings: 1 yellow (light), 2 green (medium), 2 red (heavy). oLoop/handles: Foam handles (1 pair). Double feet and hand loops (1 pair). oBuilt-in standing platform with non-slip surface for safety. oPadded seat on the foot plate. oIncludes the jump board and box. Pilates Wood Reformer with great strides and outstanding finishes. A dynamic and very comfortable machine. Ideal for studios seeking the cozy and pleasant atmosphere the Rock Maple Wood provides. The Allegro 2 System from Balanced Body will change the way you do Pilates. Standard-setting innovations offer new exercise options and smooth-as-silk transitions, for a streamlined, superlative experience. * Allows fluid transitions, plus effective new exercise options. * Make instant rope adjustments with a quick-release lever, even while lying down. * Quick-change your loops and handles. Unique soft attachment loops eliminate noise. Double padded loops included. * Smooth, quiet ride from Balanced Body's precision carriage system. Maximum comfort from our custom stability padding. * The most stable, secure tower on the market. Will not flex or bend. 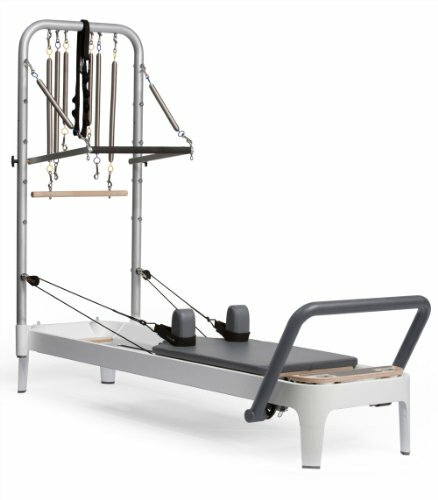 * Allows Reformer, Cadillac and mat exercises, plus integrated workouts using the Tower with the moving Reformer carriage. * Includes extra-wide push through bar, maple roll-down bar, 8 Balanced Body Signature Springs, and movable rope pulleys to change angle of resistance on exercises. * Ingenious spring storage-they stay near yet out of the way when not in use. Reformer: 15" H x 31" W x 94" L (38cm x 79cm x 238cm). Tower height: 61" from top of Reformer frame. Weight of complete system: 184.5 pounds (84kg). 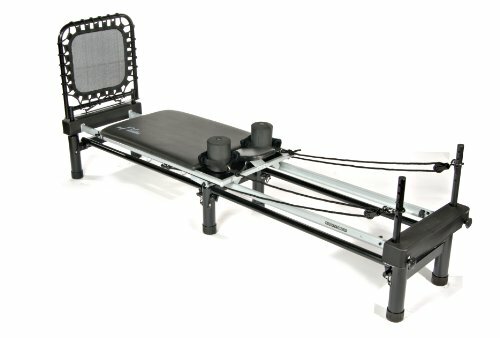 Complete system includes Allegro 2 Reformer with legs, plus Tower and Mat Conversion. 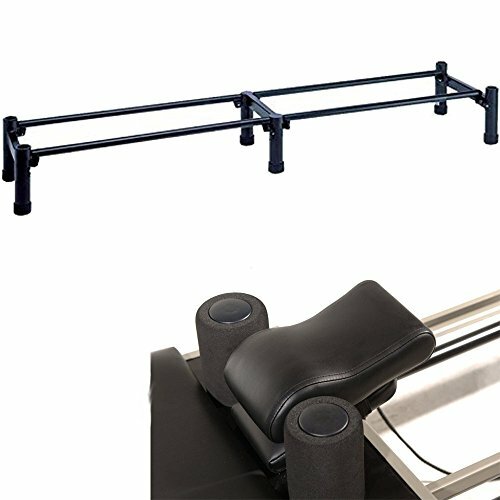 Allegro 2 Reformer comes with EasySet Footbar, SoftTouch Rope System, seamless carriage with adjustable headrest, and removable shoulder rests. Extra wide push-through bar to accommodate larger or less flexible users. Beautiful design with top-of-the-line commercial durability. Frame is powder-coated anodized aluminum with warm maple accents. The Allegro 2 Reformer from Balanced Body will change the way you do Pilates. Standard-setting innovations offer new exercise options and smooth-as-silk transitions, for a streamlined, superlative experience. * Allows the most fluid transitions, plus effective new exercise options. * Ergonomic risers feel great for Pull-Ups. Comes with EasySet Footbar, SoftTouch Rope System, seamless carriage and removable shoulder rests. Beautiful design with top-of-the-line commercial durability. Legs included, which raise the Reformer to a height of 15 inches (38cm). Great for personal training and easy on and off. Frame is powder-coated anodized aluminum with warm maple accents. Includes package of 5 Balanced Body Signature Springs with Spring Collars. State-of-the-art machine builds on traditional Pilates with a low-impact cardiovascular workout Proven to be as effective as a treadmill in burning calories and fat, but is far more gentle on your joints Designed to improve your strength, flexibility, range of motion, and cardiovascular fitness, as well as relax your mind Performs more than 50 different exercises to tone and shape your entire body Includes free-form cardio rebounder Heavy-duty steel construction in striking black and chrome Because the reformer has been elevated approximately 10 inches, more advanced exercises are possible Both adjustable headrest and oversize, high-density foam shoulder pads provide additional comfort and support Adjustable straps, hand grips, and ropes with clips will fit virtually any user Comes complete with Level 1 Workout DVD, Cardio Workout DVD, and full-color workout wall chart to help you get started Conveniently folds and rolls for easy storage when not in use Please note that some assembly is required Manufacturer's warranty included: see complete details in the Product Guarantee area Founded in 1987, Stamina is dedicated to building a stronger, healthier you. The company supplies high-quality products at excellent value to the fitness and leisure markets, showcasing hundreds of products around the world over the past two decades. Stamina is responsible for such brands as Body by Jake, Suzanne Somers, Tony Little, and more. Their mission is straightforward and admirable: Stamina strives to outperform the competition by maintaining effective communication, consistent quality, and superior service. They will continue to pursue perfection through the design excellence of these home fitness products. Assembled dimensions: 85L x 20W x 27H inches. Performs more than 50 different Pilates exercises. Heavy-duty steel frame in sleek black and chrome. Features 2 workout DVDs and full-color wall chart. 4 elastic cords provide 4 different resistance levels. The Stamina AeroPilates with Free-Form Cardio Rebounder allows you to reach and maintain your target heart rate as effectively as with a treadmill. But unlike the treadmill, this rebounder is low impact and gentle on your joints. Because you are lying on your back, there is no concussion on your legs, hips, or spine. Some Pilates' machines feature a padded jumpboard made of solid wood, but the AeroPilates Free-Form Rebounder is like jumping on a trampoline. As a result, there is more give and less shock to your joints. Plus, the AeroPilates strength and flexibility training gives you the strong, streamlined, flexible body that only Pilates can achieve. 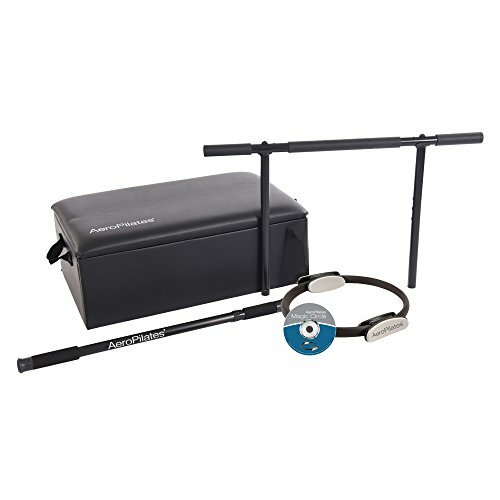 This device is elevated about 10 inches of the floor to allow for more advanced exercises and enables you to perform over 50 exercises to tone and shape your entire body. The heavy, steel frame is durable and the four heavy-duty elastic cords provide four levels of workout resistance. The adjustable headrest, along with oversized high-density foam shoulder pads, offer additional support and comfort. This system includes two workout videos, and a color workout wall chart. Experience a challenging, shaping workout with the Stamina AeroPilates Performer 286. Lets you perform a variety of Pilates reformer exercises to build core and total body strength and to improve flexibility. Folds for easy storage. The comfortable machine features an adjustable head rest, shoulder pads, and three resistance cords. Ergonomically designed carriage. Adjustable ropes. Rollers for easy portability. Folds for storage. High density foam shoulder pads. Includes 2 workout DVDs and full-color wall chart. The AeroPilates Performer 286 from Stamina is designed to deliver total-body, full range of motion training for strength, flexibility, and cardiovascular fitness. With three-resistance levels, the AeroPilates 286 allows you to perform a variety of Pilates reformer exercises to build core and total body strength, to improve flexibility, and to improve cardiovascular health. Built for comfort and stability, the AeroPilates 286 has six non-skid supports and features a wider, padded and curved foot bar, a padded carriage, a three-position headrest, and ergonomic grips with adjustable ropes. The entire unit folds and rolls away for storage. The AeroPilates Performer folds up and rolls away for storage. Features: Resistance: Three heavy-duty, elastic resistance cords Padded carriage Padded, curved footbar Three-position headrest Ergonomic hand/foot grips Adjustable ropes High-density foam shoulder pads Six non-skid supports: two on each end and two in the middle Specifications: Assembled dimensions: 85 by 17.5 by 9 inches (L x W x H) Folded dimensions: 44 by 17.5 by 9 inches (L x W x H) Maximum user weight: 300 pounds Sold steel frame Vinyl upholstery 90-day parts warranty Three-year frame warranty What's in the Box? Combines three core-focused exercises in one - yoga for flexibility, dance for calorie-burn, pilates for muscle strength and tone. Start slow and escalate your workout as you get stronger, slimmer and toned all over. 6 Free Gifts included with every order: 4 workouts dvd, fitness cards, weight loss plan, workout poster, washable cover and carrying strap. Brand: Nautilus | Manufacturer: Nautilus, Inc.